Fess Parker? The name rings the bell? No? May be you’re too young or may be you don’t know your American classics. In memory of him, because he was once, as Walt Disney's Davy Crockett, one of my heroes, when I was really young watching this old American classic on the French TV, I couldn't resist writing a little post. 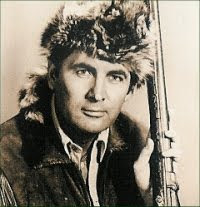 Here is to refresh your memory: Late Fess Parker (1924-2010), who just recently passed away, was an actor who was cast, in the mid-fifties, for the role of "Davy Crockett" (King of the Wild Frontier, Walt Disney, 1955). It was one of his most inspiring roles, which deeply influenced his life and many fans and generations in the same time all around the world. But what the fact that he was an actor has to do with wine, will you tell me? Well, Fess Parker was an entrepreneur and during his acting period bought a 714 acres plot of land in the Santa Ynez Valley where he could watch his little family grow and started a different career as hoteliers on his own Domaine. Realizing the potential of Santa Barbara County as a premium grape-growing region, Fess and his son, Eli, originally set out in 1989 to plant a small vineyard and sell fruit to local producers. The Fess Parker Winery and Vineyard now farms almost 700 acres on four vineyards throughout Santa Barbara County. Our wine of the day, although not listed on their website, is a side project of Fess Parker winery, called "Parker Station". Parker Station was created to offer you a high quality Pinot Noir at an affordable price, especially compared to other Pinot Noir produced in this area. The back label describes this wine in one very appropriated sentence, especially for a Californian Pinot noir wine: “The best Pinot Noir you afford to drink daily.” Intrigued, I refreshed my memories a few days ago, during a tasting at the store and was pleasantly surprised. Unlike many budget Pinots from California in general (there are always exception, granted! But so few overall…), Parker Station offers ample varietally correct fruit and attractive features at a reasonable price, especially for a wine made from grapes sourced in different locations. The grapes were partly sourced from Santa Barbara and Monterey counties; and about a 1/3 of the resulting wine was aged in French oak for about 6-9 months. 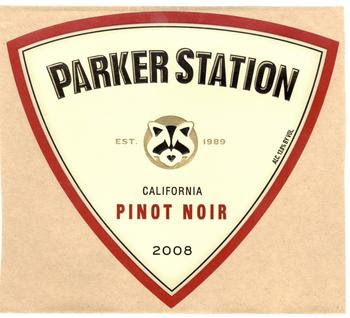 The 2008 Parker Station has a medium ruby-garnet color and expresses attractive, slightly spicy, ripe yet fresh red cherry fruit on the nose. The palate is light, clean, fairly crisp yet soft and balanced, offering well-rounded and delicious flavors of red cherry and strawberry, which persist through the mid-palate and the refreshing fruity finish. Overall, gentle, easy going and medium-bodied with a juicy finish full of the same lingering red fruit, this versatile Pinot Noir is somewhat a touch reminiscent of certain European style Pinots rather than Californian due to its lighter, ripe yet harmonious structure enhanced by good acidity. Although, don’t get me wrong, the freshly crushed omnipresent riper red fruit profile with less earthiness denotes more of a new world, warmer climate style. Surprisingly enjoyable and approachable at this price, especially compared to the ocean of other Californian Pinots that are usually for this quality much more expensive. Drink it your way with or without food.